Bless us, every one, for Porsche listens to us after all. They listened! They care! The 2018 Porsche 911 GT3 will give buyers the choice of Porsche’s ultra-fast paddle-shifted PDK transmission or a glorious good old three-pedal six-speed manual transmission, per a Porsche press release. Rejoice! When the 991-generation 911 GT3 came out, Porsche thought they knew better than us. Give it a PDK only, they said. It’s faster, they said. But they underestimated the deep satisfaction track geeks get from rowing their own gears, and this caused the last three-pedaled 911 GT3 and GT3 RS cars to become very, very desirable. Then there was the manual-transmission 911 R, which sold out as soon as the Porsche faithful knew it existed. Porsche wants back in on that action, and is finally giving its track-rat customer base what we want. 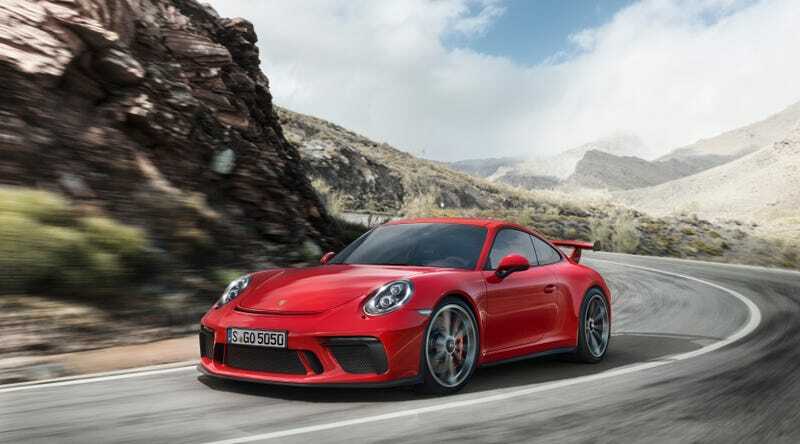 The refreshed 991.2-generation 911 GT3 will come with a naturally aspirated 4.0-liter flat-six engine good for 500 horsepower and 339 lb-ft of torque. The 2018 911 GT3's engine is based on the one used in all of the current-generation 911 race cars, including the 911 GT3 R and the 911 RSR. While Porsche has yet to release any photos of the new GT3 [at the initial time of this writing; see update below], an Instagram photo making the rounds purports to be a spy shot of the car. A couple other angles of the same taped-over car were posted on the Porsche forum Rennlist as well. It looks legit! Per Porsche’s picture-less press release, the rear end will be crowned with a lightweight carbon fiber wing. A lightweight front fascia, front spoiler, redesigned rear diffuser and and rear end exhaust openings all help optimize airflow around the new GT3. It also makes extensive use of lightweight materials, giving it a respectable power-to-weight ratio of approximately 6.4 lbs per horsepower. Best of all, there’s a little bonus for choosing the manual gearbox. With the standard seven-speed PDK gearbox, it weighs only 3,153 lbs, accelerating from 0 to 60 mph in 3.2 seconds, eventually reaching a top speed of 197 mph. But the manual is lighter—3,116 lbs—and gets an additional mile per hour in top speed. It gets from 0 to 60 in 3.8 seconds. Sure, it’s a slower 0 to 60 time than the PDK, but let’s be real: you’re going to have a lot more fun getting there if you’re the kind of person who’s been mourning the loss of three pedals ever since the 991 GT3 initially came out. Inside, you’ll find another carry-over from one of Porsche’s most incredible creations. The 14.1-inch GT Sport steering wheel is shared with the 918 Spyder. A Porsche Track Precision App comes as standard equipment for the car as well, allowing drivers to record and send their own detailed driving data to a smartphone. The Porsche Communication Management system is also now standard, for those menial tasks like navigating to the track. The 2018 911 GT3's chassis features active rear-axle steering to improve cornering. Depending on speed, the rear wheels either turn in the opposite or the same direction to help it feel more stable in turns. Dynamic engine mounts and a rear locking differential also come standard on Porsche’s newest wondertoy. The newest GT3 was developed in Weissach, and will be built alongside the other 911 road cars as well as Porsche’s insanely popular one-make series race car, the 911 GT3 Cup. Of course, three-pedal track bliss doesn’t come cheap. The 2018 911 GT3 starts at $144,650. It is expected to reach U.S. dealerships in fall 2017. UPDATE: The new 2018 911 GT3 is official as of this morning, complete with photos of the real car. The torque figure in the leaked release was one off, so we’ve updated that from 338 to 339 lb-ft of torque above. We’ve since updated this post with photos of the real thing, including a couple shots above. Check out the configurator here, or the microsite here.